Teesside University has been nominated for a multitude of national awards in a leading ceremony which celebrates research partnerships between higher education and business. 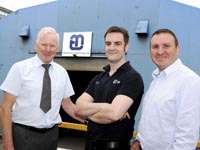 Barry Moore (centre) who has been nominated for Business Leader of the Future, pictured with Keith Bell (left), Director of Operations at Mech-Tool Engineering and Dr Ruben Pinedo-Cuenca (right), academic supervisor, Teesside University. Click here for more information about how Teesside University can help your business. The University has received a total of six nominations across all three categories in the Knowledge Transfer Partnership (KTP) Best of the Best Awards 2015. KTPs are part-funded by Innovate UK, formerly the Technology Strategy Board, and are a three-way partnership between a university, a business and a graduate. Typically, over a two year period, the graduate works within the company to complete a research project designed to improve its competitiveness and productivity through better use of knowledge, technology and skills. He or she is assisted by academic support and expertise from the partner university. Teesside has an established track record for providing high-quality KTPs. In January 2015, 87% of the University’s KTPs over the previous five years had been judged ‘outstanding’ or ‘very good’ compared with a national average of 55%. The nominated KTPs include helping Northumbrian Water investigate how water treatment sludge can be reutilised in a variety of applications; working with Niven Architects in Darlington to help implement the latest Building Information Modelling processes; looking at ways to help increase efficiency in systems and processes at Mech-Tool Engineering Ltd in Darlington and developing a new information management system at software provider Datum360 in Middlesbrough. The University has received the following nominations in this year’s KTP awards: •	Business Leader of the Future: Barry Moore, KTP Associate at Mech-Tool Engineering Ltd. •	Best Partnership: Niven Architects, Northumbrian Water. •	Research Councils UK (RCUK) Award: Niven Architects, Northumbrian Water, Datum 360. Laura Woods, Director of The Forge, Teesside University’s new business hub, said: 'KTPs are a proven way of increasing productivity and profits at a company. “We’re delighted to have been given this recognition which is just reward for innovation and commitment of both University staff and our business partners. The KTP Best of the Best Award winners will be announced at a ceremony in London on 10 November.